The Bonefish & Tarpon Trust named Duane the “Conservation Captain of the Month” in November 2015. The Conservation Captain for November 2015 is Capt. Duane Baker out of Islamorada, FL. Duane is the head of the Florida Keys Fishing Guides Association. He has also been a rockstar by helping BTT on mapping, Everglades National Park issues, genetics sampling, fishing logbooks and much more. Where do you guide and how long have you been guiding for? I guide in the FL Keys, Biscayne Bay and Everglades National Park and I have been guiding for 27 years. How did you become a fishing guide? Well, I grew up fishing in south FL and I loved fishing and the Keys. I was 23 and just went for it, when I started. How many days per year do you guide? At this point in my career I fish as much as I want to. What species do most of your clients want to fish for. Why? The majority of my clients are fly fishermen. We fish for tarpon, bonefish, permit, snook and redfish. There used to be more fish in more places. 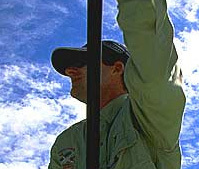 The number of anglers has fluctuated over the years. In your opinion, what is the most important conservation issue facing the Keys fishery right now and what can be done to help fix it? There are many conservation problems facing the Keys. Water quality, the bonefish population, the population growth in FL. Size limits, bag limits and closure to harvest during spawning months should help all fish species. Despite some of the negative things happening to our fishery, why do you love it so much? I love fishing in the Keys and we still have good fishing. This is the birthplace of shallow water fishing and I have been privileged to make a career as a guide in the Keys. Why do you support Bonefish and Tarpon Trust? BTT is doing a great job trying to protect and enhance fishing for these great gamefish. I was first introduced to BTT by founder Tom Davidson in the mid 90’s. We had an epic day of bonefishing and he asked me to help out. I have given my opinion on different topics over the years. BTT has always listened. In your opinion, what is the most important work that BTT does and why? I think ALL the work BTT undertakes is important. This is a big puzzle and there are many pieces. Hopefully it will be filled in soon. Why should a fisherman that doesn’t live in Florida or the Caribbean care about BTT? BTT’s science can be applied to all bonefish and tarpon habitat worldwide. You have the day off. What species are you going to fish for, where are you going to find them, and how are you going to catch them. When I have a day off I love to fly fish for tarpon or bonefish or the rest of them. I usually let the conditions dictate my plan, just like a charter. Tell us one of your favorite fishing stories. I have had the privilege of experiencing some great fishing. I have had my share of bad fishing also. There are too many fish stories to list. Probably the most recent is watching my 14 year old son catch 2 large tarpon on fly.